The main emphasis at Jicho'oshin Dojo is traditional Skotokan Karate. This training has several aspects, which are detailed below. More than simple training, traditional karate is a way of life, and students are expected to apply the character lessons they learn in class in their daily lives. 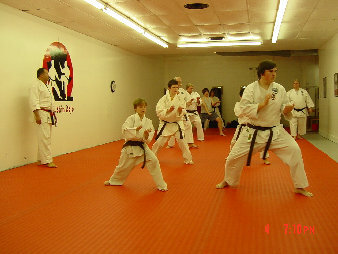 Kihon, or basic techniques, lay the foundation for the practice of martial arts, and these techniques are emphasized at Jichooshin Dojo. 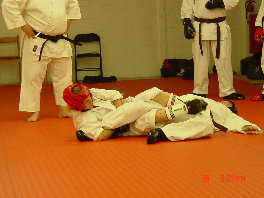 As the student becomes more advanced, so do the range of techniques available. 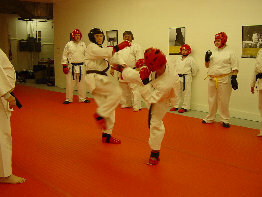 Kumite, or sparring, is practiced in two distinct styles. Kihon kumite, or basic sparring, is practiced in 1, 3, and 5 step combinations, help the student develop timing, distance, and responses to attack. Jiyu Kumite, or free sparring, is practiced with a partner to hone the basic attacks and defenses taught in the course of training.